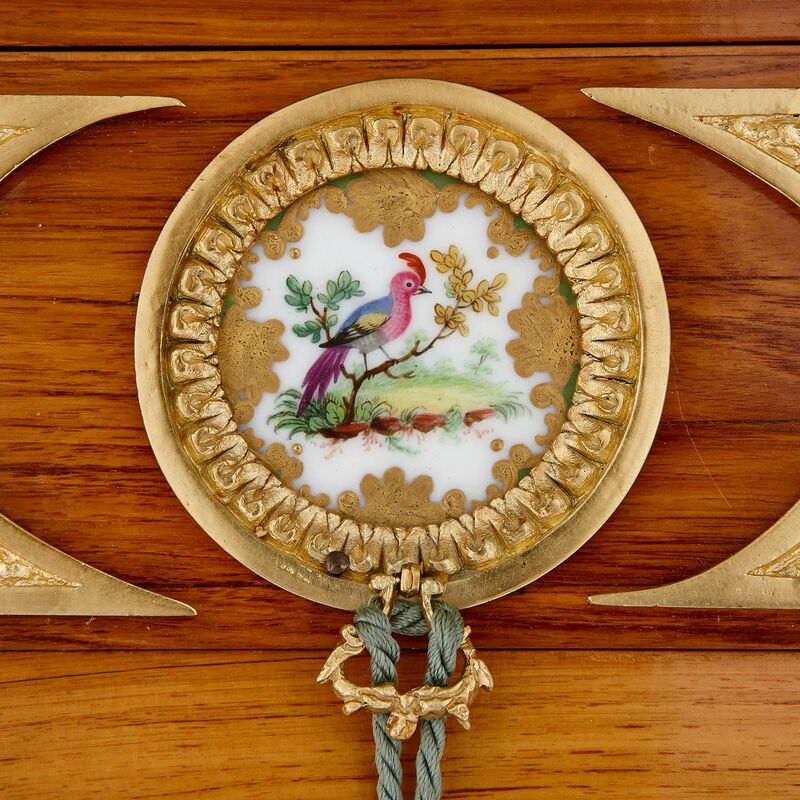 This occasional table is remarkable for its beautifully painted and gilt porcelain mounts, depicting exotic, colourful birds, set within ormolu frames. 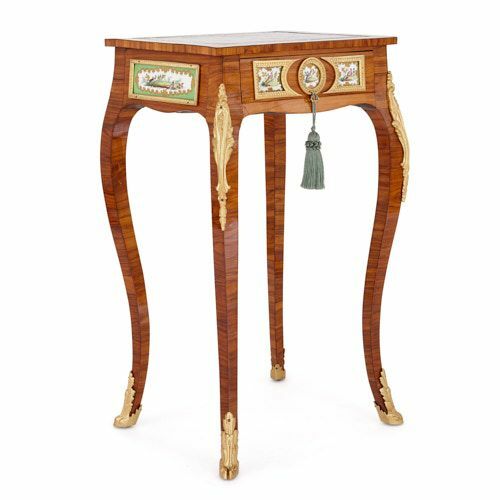 This table has been crafted from kingwood and set with beautiful painted porcelain plaques, framed in sumptuous ormolu mounts. 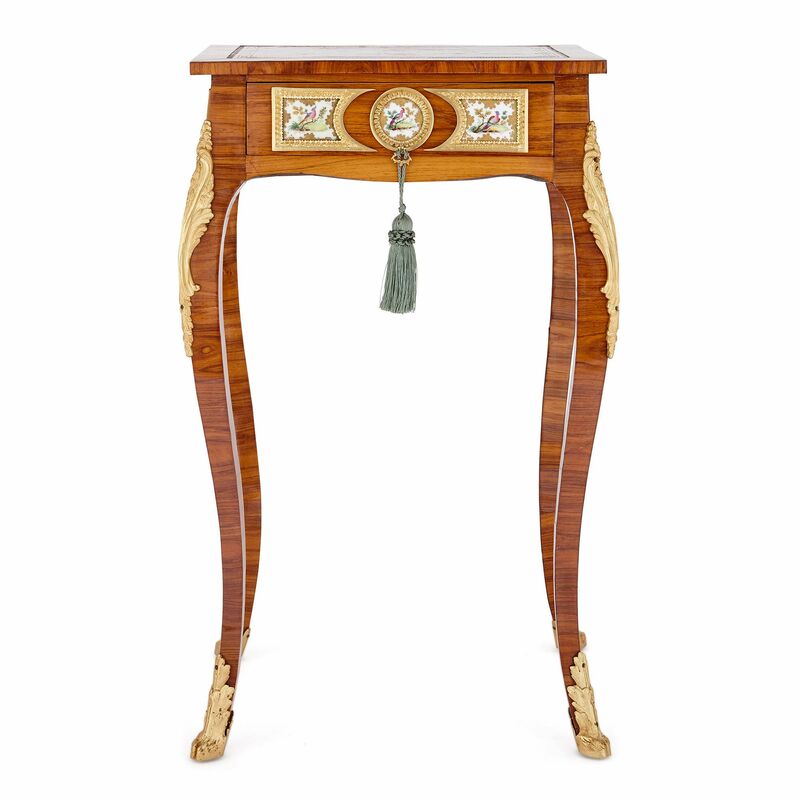 The piece is styled in a way that is reminiscent of Louis XV period furniture, with a rectangular table top set on four, elegant cabriole legs. The cabriole legs are set on four stylised, ormolu hoof feet, with foliate shins, and mounted, near their tops, with scrolling, ormolu leaf mounts. The panels of kingwood that have been used to construct the legs and body have been arranged to create interesting striped patterns. 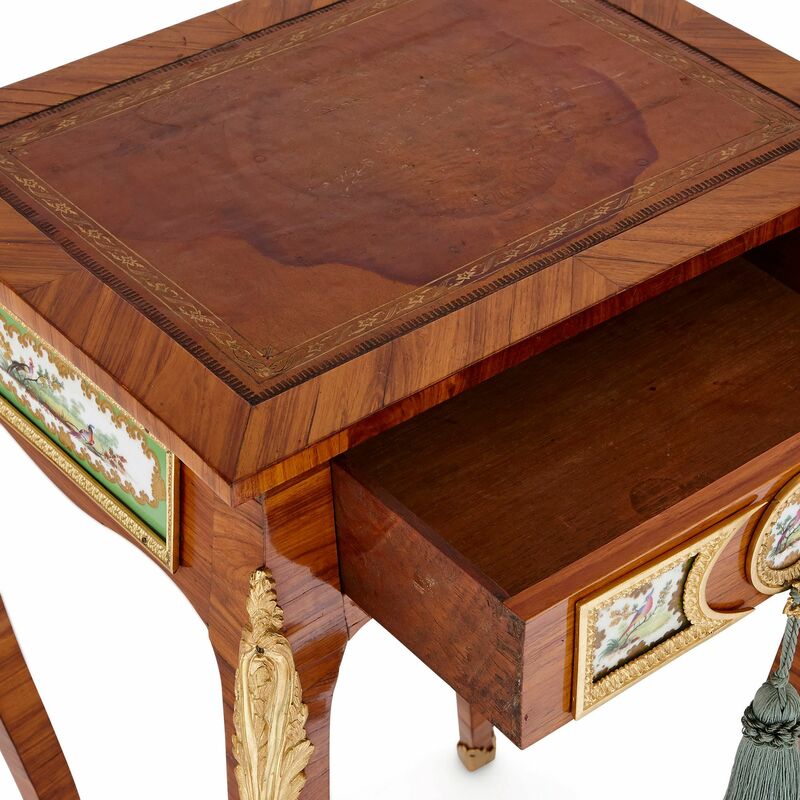 The rectangular body is mounted on its front and sides with painted porcelain plaques, contained within foliate, ormolu frames. The front kingwood panel is decorated with a central, circular porcelain panel, which is painted with a stylised, colourful image of a bird, set against a white ground with a gilt border. 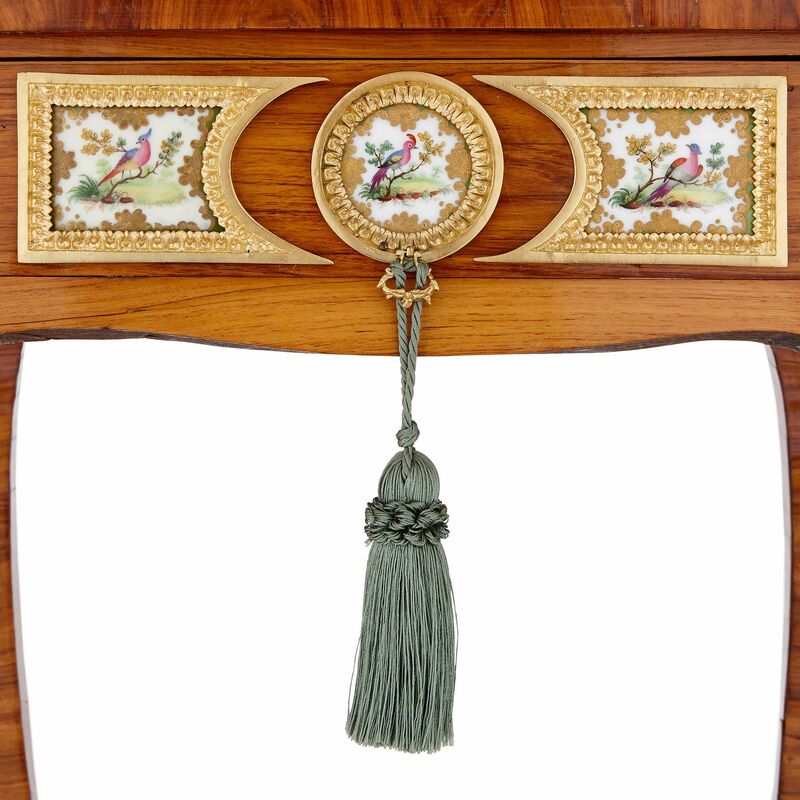 This scene is enclosed within an ormolu frame that is fitted with a small, round handle, from which a large blue-coloured tassel hangs. Flanking this circular panel are two panels, which are similarly painted with birds at their centres. These side plaques are rectangular on one end and crescent-shaped on the other, as though they can easily slot together with the central piece to form a continuous, painted frieze. This front panel can be pulled out to reveal a drawer behind. 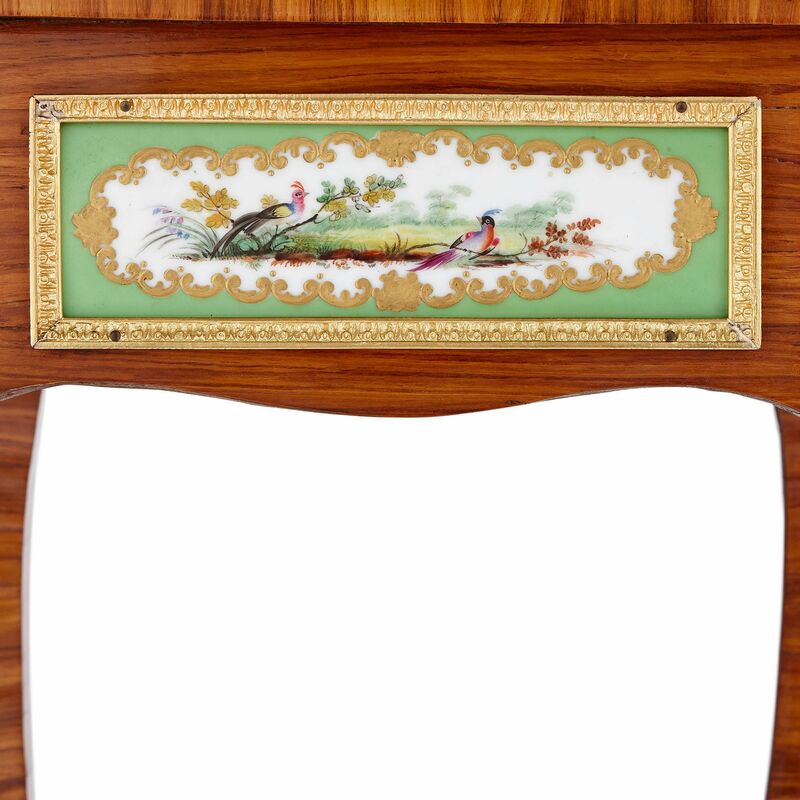 Each side is mounted with a rectangular panel, which has been painted with a pair of birds, contained within a scrolling, gilt border, set against a green ground and framed. The top of the piece features a central, rectangular leather panel, with decorative borders.